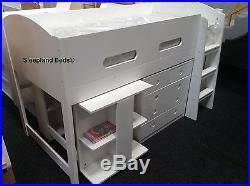 More Childrens Premium Midsleeper Beds. 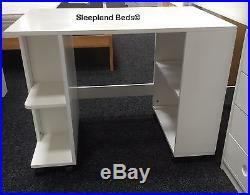 Elegant White Solid Wood Midsleeper with Boockcase, Chest and Desk. The Sleepland exclusive solid pine Elegant midsleeper is our handmade luxury children's bed that includes a chest of drawers, desk and bookcase. Special offer: Two free pillows with this bed. The ladder is universal on the Elegant and can be fitted either end of the bed to ensure it adapts to your needs within your child's bedroom. The bed is solid and built to last with solid pine slats with extra struts for support. The chest of drawers have reinforced runners and extra thick bases to ensure the stability of the storage. At Sleepland Beds® we are a family company that takes the greatest pride in the exceptional safety, quality and design of our own range of children's beds. This is a premium product, and the value is honestly not reflected in the price. Made direct and exclusively for us, and we give the best value possible. 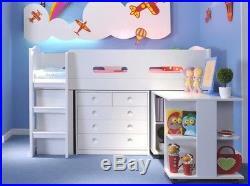 You will only find our unique range of childrens beds here and at our online store and showroom. 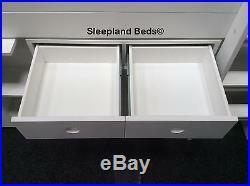 Sleepland Beds® White Elegant Midsleeper Features. 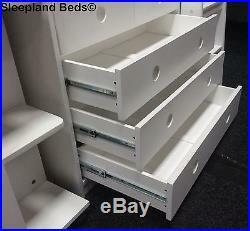 Exclusive Sleepland Beds white wooden mid sleeper. Hand made - traditionally carved, polished and finished. Rock solid build, luxury mid sleeper made to last. Smooth white finish, multiple coatings of Eco white, you can't see wood. Extra strong and solid desk with castors to utilise around the room. Stylish carved chest of drawers. Solid base in drawers for extra strength. End bookcase (ladder and bookcase can be fitted either side). Desk size: 95cm x 60cm x 72cm. 5 drawer chest: 80cm x 40cm x 72cm. Bookcase 85.4cm x 40cm x 72cm. 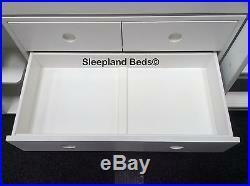 Accommodates a full size 3ft x 6ft 3 single mattress. Also on display in our Hooton, Cheshire showroom. All our beds are extra safe, brand new and very high quality. All with a full one year guarantee. Optional 3ft Single Mattress Details. Standard: Popular mattress from our starter range. 13.5 gauge open springs. I'll be honest, please don't expect the best mattress in the world, impossible to make at this price. However it is good value, a fair compromise when budgets are stretched and better than what are classed as "budget" mattresses. Superior Standard Plus: As with the Standard, except has slightly more fillings and is encased in a quilted damask. Again a value mattress, it's not amazing that's impossible at this price, we do offer more premium mattresses below. Not plastic or shiny, it feels nice whilst protecting the fillings. Crib 5, making it also suitable for contract use. Supportive 13.5 gauge open coil springs with 6 steel gauge rod edge for extra support across entire mattress. Pocket 1000: Pocket sprung mattress that is very comfortable and supportive for children. A specially commissioned depth, ensuring it is safe for the top bunk. 600 pocket springs in the single, the perfect amount of children's support. With layers of hypo allergenic fillings for sumptuous comfort. Encased in a cotton damask fabric with soft woollen tufts. Highly supportive and contours to your child's natural shape and movement, for correct postural alignment yet, with the softest medium comfort feel Super comfort fillings covered in a luxury foam. Foam encapsulated sides, this gives extra comfort and support across entire surface, plus prevents sagging. 600 superior quality pocket springs, bonded together in mid section, improving the movement of each individual spring. Luxury quality mattress cover can be removed for washing. Hypo allergenic and anti dustmite. Memory Foam Mattress - Sumptuous Medium Feel, Perfect Support: We've chosen this mattress as it's the perfect memory foam mattress for children and teenagers and super comfortable. 2.5cm of 55kg high density memory foam and 12.5cm of reflex foam moulds and supports body contours, this will ensure correct posture and spinal alignment. The pressure relief leads to less tossing and turning for a deeper sleep. Hypo allergenic and anti dustmite, anti bacterial, anti fungal, independently certified that no nasty chemicals are used. Breathable foam and doesn't make you warm. Soft white quilted cover can be washed up to 40º. Hand made for us by Which best memory foam mattress winners, top quality UK foam. 10 year guarantee on mattress. Luxury Latex: Again exclusive to us at Sleepland Beds our latex mattress is the top of the luxury mattresses giving your children the best support possible throughout the night. Its hypo-allergenic, Anti-bacterial, anti-microbial, anti-fungal so excellent if they suffer from allergies or excema. England, South Scotland and Wales: Sellers Standard Rate: Free (exceptions below). Postcodes starting with DT, NE, YO, SR, TS, BH, EX, TD, NR, PA, CT, PL, TQ, SA. IP, BA, TN, TA, BH, CO, RH, KA. Some ME, PE and BN. Lead time can be between 3-6 weeks. North and South West Scotland. Including PA, IV, KW, DG8, DG9, DD and some postcodes starting PH. We have a reliable, family run specialist Irish carrier that delivers our goods to customers homes in Ireland and Northern Ireland every week. The item "Elegant White Midsleeper Cabin Bed with Desk Storage & Bookcase 2 FREE PILLOWS" is in sale since Thursday, January 21, 2016. 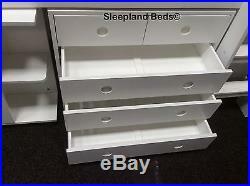 This item is in the category "Home, Furniture & DIY\Children's Home & Furniture\Furniture\Bedframes & Divan Bases". 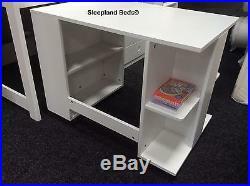 The seller is "bedplanet1" and is located in Hooton, Wirral. This item can be shipped to United Kingdom.